Height: Front 4.75", Rear 5.75"
Completely new design plenum and runners for optimized air/fuel distribution and power! Weiand recognized that todays engine technology has really advanced in our performance world since the Stealth series intake manifolds were originally designed some years ago. 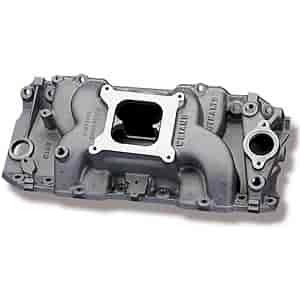 With larger stroker motors, more efficient cylinder head designs and aggresive cam profiles has brought about a need for an intake manifold capable of supporting these power houses. So Weiand wiped the work bench clean and started over. The newly redesigned Stealth dual plane intakes will nearly match a single plane manifold's peak horsepower number with a much fatter torque curve that is perfect for street and heavy duty/towing applications. In addition, some of these manifolds feature Weiand's Everbright coating. Virtually maintenance-free, this polished finish is the product of vacuum metalizing technology and protective clearcoating...looks good, lasts long. JEGS Easy Kits are designed by JEGS Professionals to assist your shopping experience. Kit includes Weiand Intake Manifold, Intake Gaskets, Intake Bolts, Carb Gasket, Carb Studs and RTV Silicone Sealer. Does Weiand 8018 fit your vehicle?